FLORHAM PARK, N.J. – The NFL said Friday it would review allegations involving the Vikings' Brett Favre, who the website Deadspin said sent racy messages and photos to a former game hostess while he was the Jets' quarterback in 2008. "We are reviewing the matter," league spokesman Greg Aiello said when asked about reports that a person alleged to be Favre sent voicemails and lewd pictures to Jenn Sterger. 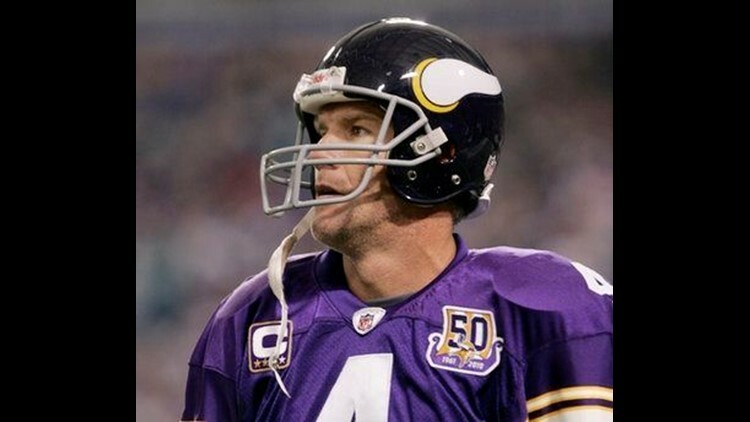 Asked to respond to the Deadspin report on Thursday, Favre said: "I'm not getting into that. I've got my hands full with the Jets and am trying to get some timing down with our guys, so that's all I'm going to discuss." Vikings coach Brad Childress had no comment after Friday's practice. He said he was not aware of either the NFL's investigation or the website's allegations. Bus Cook, the agent for the three-time league MVP, didn't immediately return messages. Later Friday, Deadspin reported that Favre also pursued two female massage therapists who worked part-time for the team, according to one of the women. Deadspin did not identify the women, but a Jets spokesman said the team has contact information for the two women and was giving that information to the league. The Jets spokesman requested anonymity because the NFL investigation is ongoing. The women were two of 17 massage therapists the Jets used during what they called two intensive recovery days in training camp in 2008. According to Deadspin, one woman exchanged phone numbers with Favre, and the other woman told the website that the quarterback sent "nasty" text messages and invited both women to his hotel room. On Thursday, Deadspin reported that a man alleged to be Favre contacted Sterger on MySpace and began leaving her voicemails. The website posted a video of the voicemails and several graphic pictures allegedly sent to Sterger's cell phone. "Send me a text. Love to see you tonight," one voicemail said. The 26-year-old Sterger, now a TV personality for Versus, has a website that describes her as an actress, model, writer and television host. Her duties during Jets games included introducing the Jets' dance team, asking trivia questions and making announcements to the crowd. Sterger's manager Phil Reese said she is "not doing any interviews or commenting at this time," but that "Jenn did not provide Deadspin with any information." In an e-mail to The Associated Press, A.J. Daulerio, Deadspin's editor in chief, declined to reveal the source of the material. He did say the source of the photos contacted him and that Deadspin paid "more than we ever have" for them. "I was certain about the accuracy of her story, the evidence was presented substantiating that," he said, "and then as things began to unfold, it appeared more and more likely that this happened. Plus, there will be more." The Jets referred all questions to their public relations firm, Sunshine, Sachs and Associates. "We are working closely with the league in their review of this matter," said the firm's spokesman, Jesse Derris. Deadspin also reported that Jets director of media relations Jared Winley may have been an intermediary between Favre and Sterger. But Derris said Winley "played no role in this alleged incident." If the NFL finds that Favre violated its personal conduct policy, Favre could be fined or even suspended. The league's policy allows it to punish a wide range of behavior, even that which is not illegal. Commissioner Roger Goodell used the policy to suspend Pittsburgh Steelers quarterback Ben Roethlisberger for four games after he was accused of, but not charged with, sexually assaulting a 20-year-old woman at a Georgia college bar. Favre, who turns 41 Sunday, and his wife, Deanna, have been married 14 years. He became a grandfather in the spring. AP Sports Writers Rick Freeman in New York and Dennis Waszak Jr. in Florham Park contributed to this story.